He-Man, the giant of Saturday morning cartoons, is the subject of a new art show in Los Angeles. Opening on Friday at Gallery1988 "Under the Influence: He-Man and the Masters of the Universe" features 100 different artists offering their unique takes on the colorful cast that made up the show. 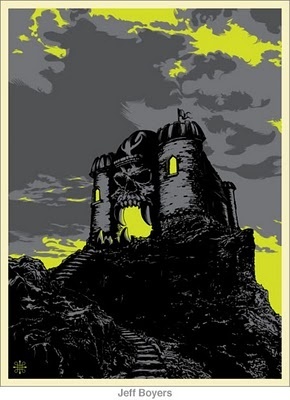 Whether it's an ultra-cute Cringer painting or He-Man and Skeletor wooden puppets, or even a print of the iconic Castle Greyskull (pictured), there seems to be no end to the variety at the show. The show runs until the 29th of January, and you can get more information about it here.